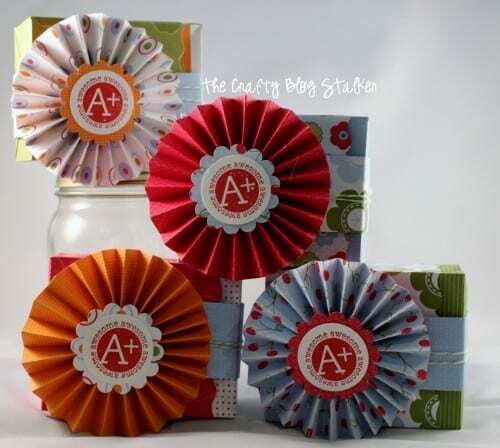 Make a Teacher Appreciation Gift for your child’s teacher. 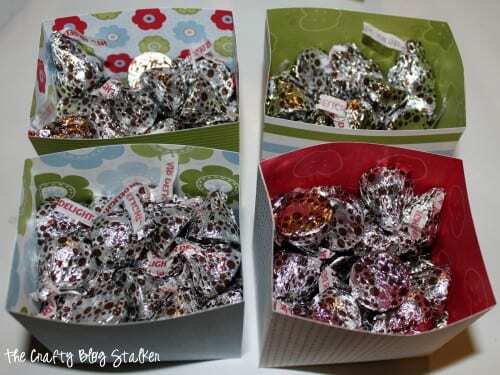 An easy DIY craft tutorial idea for a teacher appreciation gift you can fill with fun treats! Is school almost out for your kids too? My kids teachers have been amazing and both my kids and I are really going to miss them. The really do deserve so much more than this, but hopefully this small teacher gift, but hopefully it will let them know how much they are appreciated. 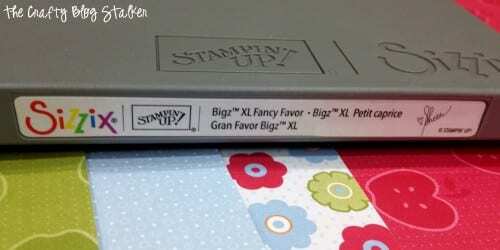 This die makes more of a bag but if you put two of them together you will get a box! 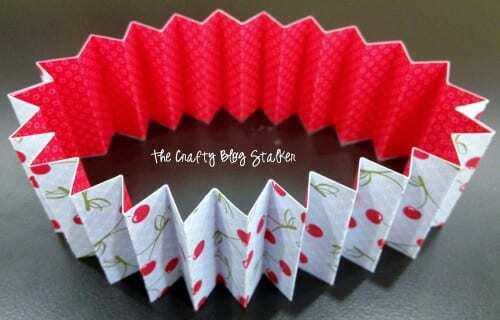 The die gives each side of the box a cute wavy edge. Leave the wavy edge on the box that is going to be on the lid and trim the wavy edge off of the box that will be the inside portion. Each piece makes one side of the box. This is what it looks like when you put them together. Fill the inside box with candy. I used Hershey Kisses. The next step is the Rosette to decorate the box. I love rosettes and have used them in many projects like Decorative Word Paper Banner, Hanging Lolly Art and Rosette Gift Topper. 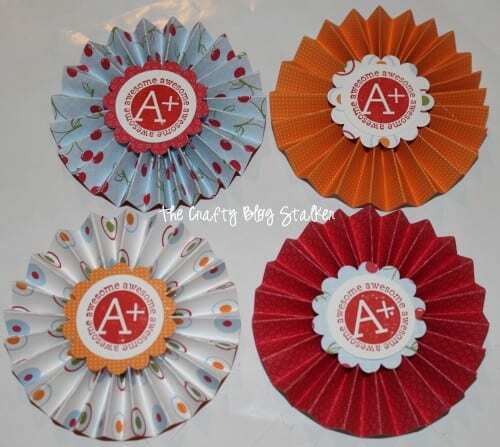 To make this rosette use a scoring board and cut 2 strips of paper 1 3/4 x 12 inches and scored every 1/2 inch. After the paper is scored do an accordion fold so the two strips look like this. Glue the ends of the two strips together so it makes a ring. The next step is difficult to take pictures of because I needed both of my hands. Push the ring flat and push the inside together. 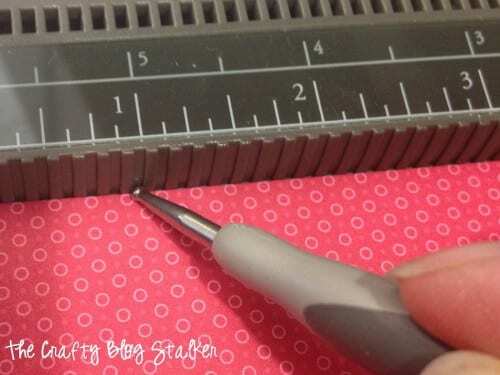 Add a glob of hot glue in the very center and put a scrap of paper on it to secure it. This will be the back so it doesn’t have to be pretty. I used an A+ stamp I had on hand and used a circle punch and a slightly larger scallop circle punch as the background and hot glued them together. 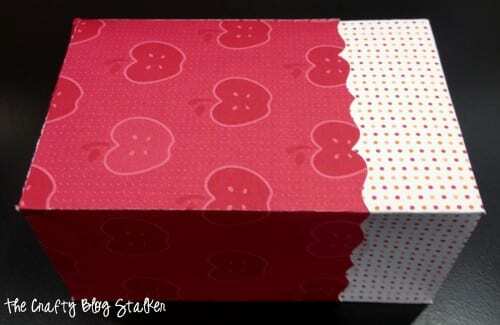 For the belly band, cut a strip of scrapbook paper 1 1/2 x 12 inches, wrap around the box and hot glue the ends together. Hot glue the rosette to the belly band and there you have it. 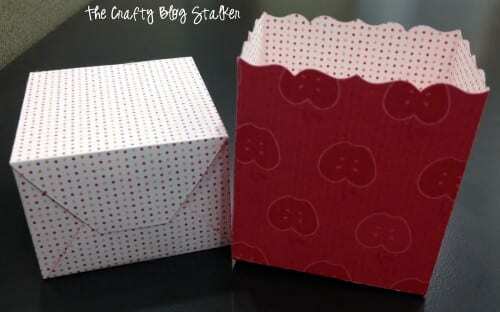 A cute little gift box filled with candy for my kid’s teachers. I hope they know how much I appreciate them! 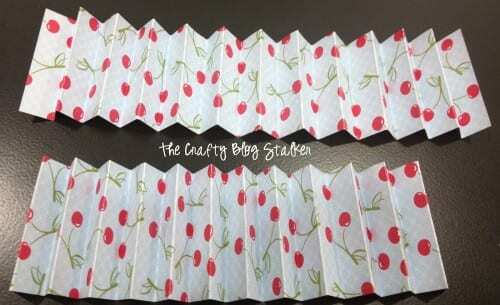 What handmade gifts have you made for teacher appreciation? Share and leave a comment below! SAVE HOW TO MAKE TEACHER APPRECIATION GIFT BOXES TO YOUR FAVORITE DIY PINTEREST BOARD! These are so cute. I love the little A+. I would love it if you would stop by and share at Lines Across. These are so great!! I love the papers you used!! THis is such a sweet idea. Thanks for sharing at our party this week. What a perfectly sweet and cute idea…Thanks for sharing. Have a wonderful weekend. How adorable! Thanks for sharing at Things I’ve Done Thursday! Beautiful looking. I wondered how to make something like this. Now I see. Those are amazing. Too cute and much prettier than bought bags or containers :)Thanks so much for sharing at Toot Your Horn Tuesday. CUte–love all the layers of color! These are great teacher gifts! I am featuring this at my I Love Fridays party this week. Feel free to stop by and grab a featured button 🙂 Can’t wait to see what you link up next! So very pretty…I Love It!!! The paper you’ve used is so cheerful too…I bet the teachers will swoon over this gift! These are so cute. I’m going to have to pin this for next year.